Warroo Shire (13,660 sq km) was in south-central Queensland, generally 400 km west of Brisbane and 200 km north of the New South Wales border. It was named after a minor pastoral station in the south of the shire and the neighbouring Balonne Shire. In 2008 Warroo Shire was amalgamated with Roma Town and Bendamere, Bungil and Booringa Shires to form Roma Regional Council. The area was explored by the New South Wales Surveyor-General, Sir Thomas Mitchell, in 1846. Within a year the first pastoral occupation occurred, and in 1850 a local court of petty sessions was installed at the Surat township site. 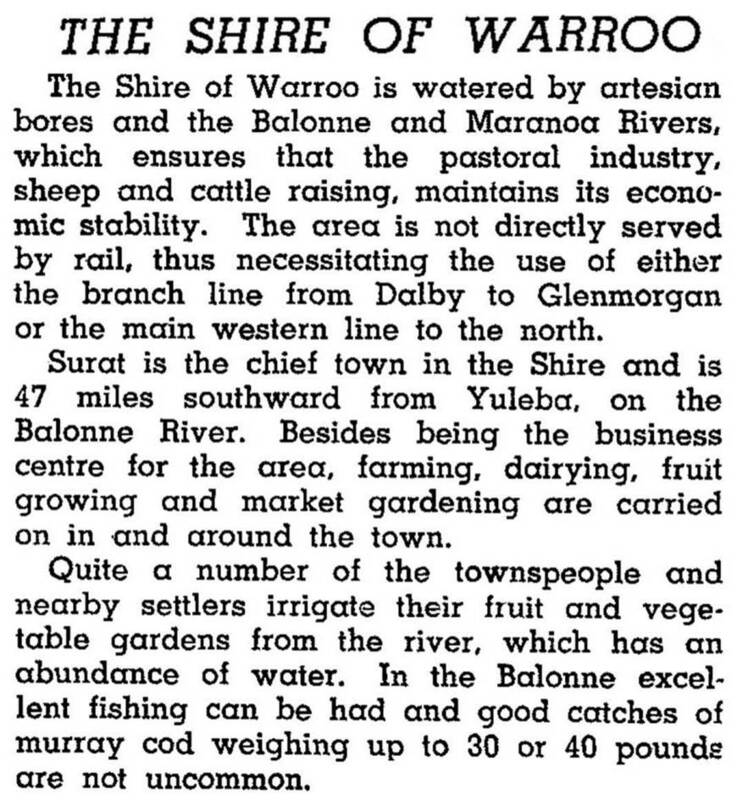 When local government was approved for the district in 1879, the Warroo division had Surat as its administrative centre. Surat remained the shire's sole urban centre. A considerable part of the shire lay on the Surat basin, an area that as early as 1900 was identified as having underground gas reserves that were encountered while drilling for artesian water near Roma. In 1961 the basin yielded a commercially viable oil flow at Moonie, about 100 km south-east of Surat. It was the beginning of serious oil production in Australia. The basin has been drilled for numerous flows of gas and oil.